What is AEGIS? It is the All-wavelength Extended Groth strip International Survey. What is the Groth Strip, then? It’s a narrow band of sky on the edge of Ursa Major and Bootes that’s absolutely crawling with galaxies, and which astronomers have decided to subject to the scrutiny of just about every instrument in their arsenal — visible light imagery comes from the Hubble Space Telescope (which is already in Google Sky’s base layer), ultraviolet light is courtesy of NASA’s Galaxy Evolution Explorer (GALEX) satellite, infrared we get from the Infrared Array Camera on NASA’s Spitzer Space Telescope, and x-ray imagery is from NASA’s Chandra X-ray Observatory. The latter three are visible as overlays whose opacity you can control to check what kind of an impression objects leave at different wavelengths. Many extragalactic objects in the region are also catalogued, and linked to the DEEP2 Galaxy Redshift database. Some objects get a special shout out. 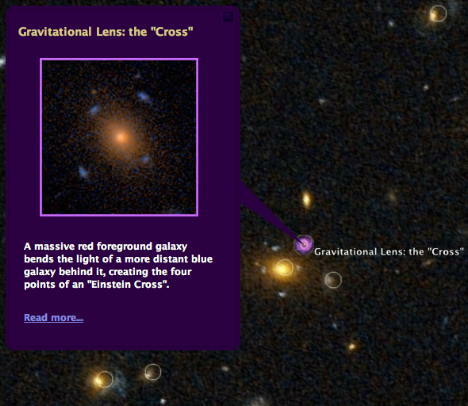 Look, real gravitational lenses! Here’s the AEGIS layer, which is linked to from this page in the Google Earth Gallery. AEGIS also has a more detailed explanation page and instructions. This is Google Sky doing what it was designed to do. Thanks, that was stupid. Fixed.